If you’re a big fan of Wal Mart (and who isn’t? ), you’ve probably noticed a disturbing trend lately. No, I’m not talking about the fact that they’re beginning to get rid of their jewelry departments. Although that’s pretty disturbing, I’ll admit. Nothing says “I love you and want to spend the rest of my life with you” like picking up an engagement ring at the same place you can get an oil change and buy Spaghettios. The disturbance to which I refer is the Wal Mart greeter. 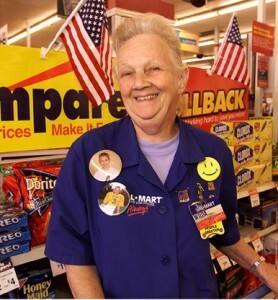 Gone are the days of sweet greeter Debbie, the adorable little lady with developmental disabilities who hugged everybody at my hometown Wal Mart. You would be walking in to buy…let’s say…asparagus; and walk out feeling better about the world in general, because sweet greeter Debbie was going to hug you. And she’d mean it. She was genuinely happy to see you. Unfortunately, sweet greeter Debbie has been replaced with a security force armed with laser scanners and inventory tags and maybe a Glock handgun…who knows what’s under that blue vest. The new breed of Wal Mart greeter – I think they now refer to them at the “Greeternator 9000” – is not there to shake your hand, but to shake you down. They’re not there as a welcome, but a warning. I realize that this is not a new thing…Wal Mart’s reasoning for adding greeters to their employee base back in the 80’s was, in part, an effort to curb shoplifting. But the old-style greeter was a friend first, a security presence second. Today’s greeter – with all of their high-tech devices and receipt highlighters – seem more gestapo than grinning granny. I don’t fault Wal Mart for this – their estimated annual losses from shoplifting is over $3 billion. But it seems as though in an effort to maintain the bottom line, they’ve lost the personal touch. What “personal touch” have you lost in your church? Do your greeters more often say “Don’t sit there!” rather than “Glad you’re here?” Do your children’s workers focus more on getting the lesson taught than knowing the kids’ hearts? As a pastor, do you focus more on what your church is against rather than what you’re for? I’ll be the very first to admit that the church has to take care of business, and at times our volunteers and paid staff are the ones that have to carry that business out. But we do a great disservice to the hospitality aspect of the gospel when we focus more on the rules than on grace. I read once that rules without a relationship leads to rebellion. Our people are much more likely to abide by our so-called “rules” if we do everything possible to place people before policy. I like my wal-mart greeter to be as well armed as I am. The Wal*Mart greeter we had in West Virginia was great. He would always make sure he asked me if I needed anything. He was great. But the ones here in Texas are more like Hitler’s Nazis. Not friendly at all. So I will continue to pray for them.